Women are impacted disproportionately when affected by climate change. At the same time, there has been a lack of gender balance and gender considerations in the multilateral negotiations and policy-making process. On December 9th, 2014, Gender Day was held at the United Nations Framework Convention on Climate Change (UNFCCC) Conference of Parties (COP) 20 in Lima, Peru, the third COP in a row with a “Gender Day” to raise awareness of gender issues in climate change. On this year’s Gender Day, a discussion on gender and climate change between Ms. Mary Robinson, United Nations Special Envoy for Climate Change, and Ms. Lakshmi Puri, Assistant Secretary-General of the United Nations and Deputy Executive Director of UN Women, was held to explore why and how to achieve gender equality in climate action. The conversation was moderated by Lorena Aguilar, Global Senior Gender Adviser of IUCN’s Global Gender Office. “Let’s stop being defensive. Let’s be assertive,” said Ms. Robinson at the Momentum for Change event. Gender equality is important, not only because women are usually more affected due to their role in the family and in the society, but because women could also contribute their valuable knowledge and skills to policies and actions in response to climate change. To engage more women to play their part and achieve gender equality in climate action, Ms. Robinson highlighted that it is critical for women to claim their rights in participating in the policy-making process. Ms. Puri pointed out that the support from negotiators and countries is also invaluable. At the same time, strong advocacy and well-planned campaigns will help to construct a solid case on women’s leadership role in climate action. Momentum for Change is an initiative that has been dedicated to making a difference on gender equality in climate change by UNFCCC. The initiative is spearheaded by the United Nations Climate Change Secretariat to highlight activities underway across the globe that are moving the world toward a highly resilient, low-carbon future. Momentum for Change recognizes innovative and transformative solutions that address both climate change and wider economic, social and environmental challenges. 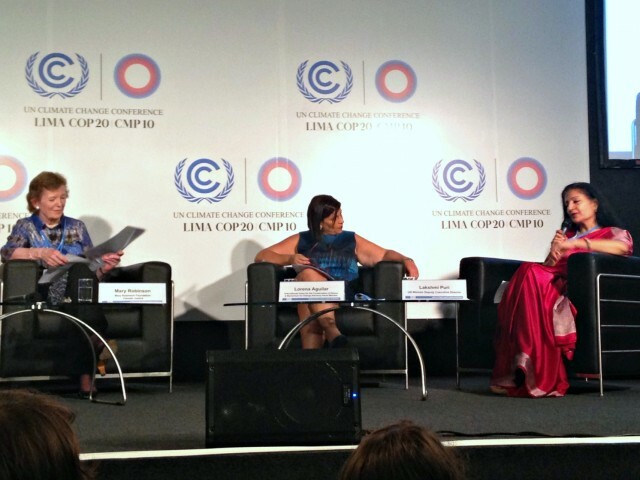 Lorena Aguilar, IUCN GGO (center), moderates discussion with Ms. Mary Robinson, United Nations Special Envoy for Climate Change (left), and Ms. Lakshmi Puri, Assistant Secretary-General of the United Nations and Deputy Executive Director of UN Women (right). Siqi Han is an M.E.M. Candidate in Environmental Economics and Policy at Duke University. She holds a B.S. in Economics and International Affairs and a Certificate in Marketing from Georgia Institute of Technology. Siqi attended COP20 in Lima, Peru, and assisted IUCN’s Global Gender Office leading up to and throughout the event.